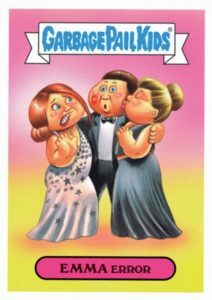 The 2017 Golden Globes had it all: winners, losers, and, of course, GPK stickers. 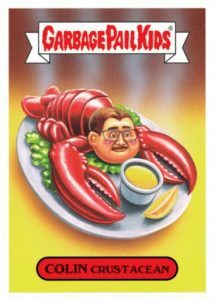 2017 Topps Garbage Pail Kids Golden Groans Awards cards look to the annual ceremony to honor their own standouts, albeit with the normal GPK humor. Focusing on five main images, each card comes in two different caption versions. The two-card sets go for $9.99 while the complete set sells for $29.99. 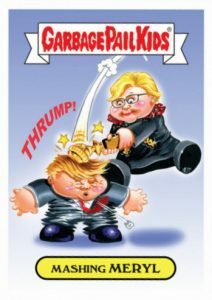 Celebs earning attention from GPK include Meryl Streep, thanks to her speech bashing Donald Trump, as well as error-prone Jimmy Fallon, and the awkward encounter for Emma Stone. 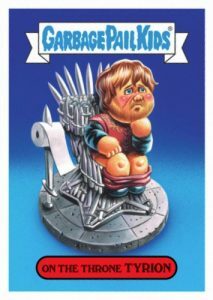 The ten-card 2017 Topps Garbage Pail Kids Golden Groans Awards sticker release is exclusively found through the Topps online site for one week. After that, the cards are removed and final print runs are announced. 10 cards. Shop for cards on Topps. Card titles are different for each subject but the images are the same for both cards. Available at Topps.com until 1/16/2017 at Noon EST.